The opening chapter - A Proper Mage - is set just before the beginning of Year Three and reveals that John Constantine was not the first magician to whom Batman turned for help after Zatanna. 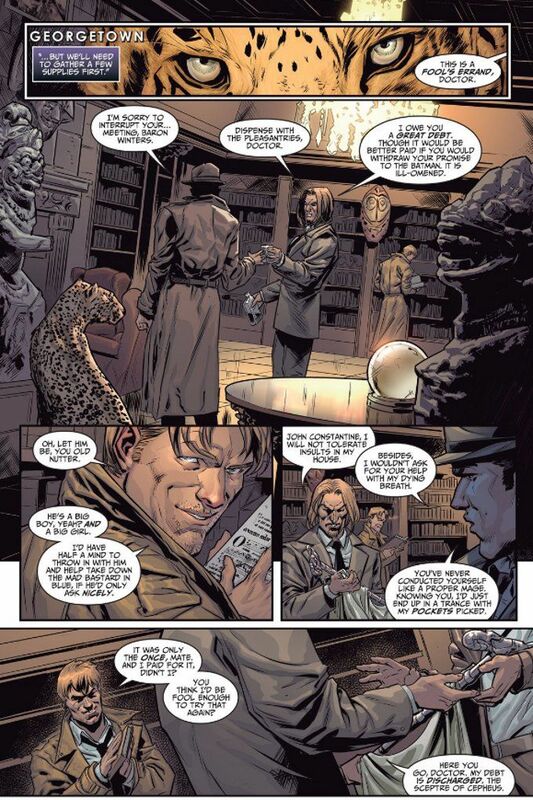 That honor went to the team of Rose Psychic and Doctor Occult, whom quickly piqued John Constantine's interest and inspired him to offer his assistance... whether they wanted it or not. Written by Constantine writer Ray Fawkes, this tale is a fine look at the parts of the supernatural side of the DC Comics Universe that we didn't see during Year Three. This story also offers a good explanation for just how the usually neutral John Constantine became so hell-bent on getting involved in the fight against Superman as well as how he got such wonderful toys with endless possibilities, such as a bag of "nameless sand". The second story - Fall of The Titans - answers a question that many Teen Titans fans had regarding the Injustice Universe - where the heck are Beast Boy, Starfire, Kid Flash and all the other sidekicks? The only Titans we saw in the game and the comics until now were Cyborg, Raven and Nightwing. That's a good chunk of the team missing in action! While this story by Brian Buccellato won't satisfy all of the Titans fans (there's no sign of Donna Troy or Roy Harper, for instance) it is good for what it is. 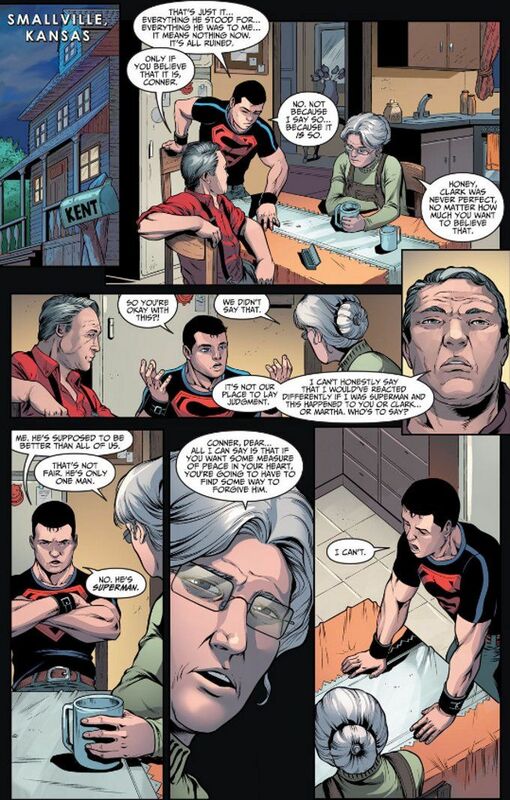 The subplot involving Connor Kent's reaction to his mentor taking a life is an interesting mirror to the feelings of many Superman fans regarding the core conceit of Injustice and there's some interesting interplay between Starfire and Nightwing, who recently left The Titans to join The Justice League in this reality. As per usual for this series, the artwork is top notch. Xermanic and Alejandro Sanchez do their usual sterling job on the first chapter. Sergio Davila, Juan Albarran and Rex Lokus ace it on the second chapter. And Wes Abbott does an amazing job lettering both chapters. All in all this issue is well worth the $4.99 price tag. 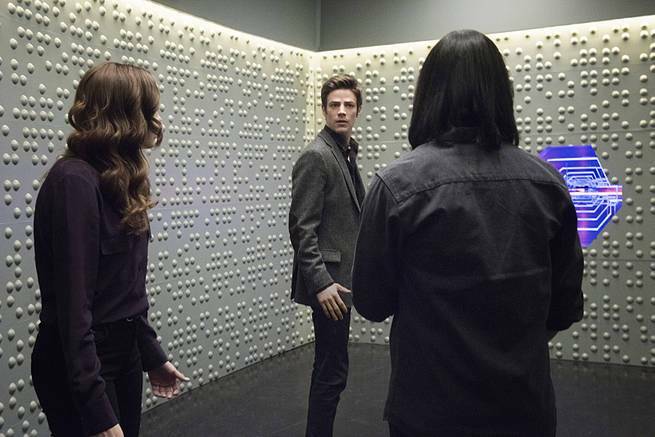 Having uncovered undeniable proof that the man they knew as Harrison Wells is The Reverse-Flash, Barry, Caitlin and Cisco must set a trap for their mentor. 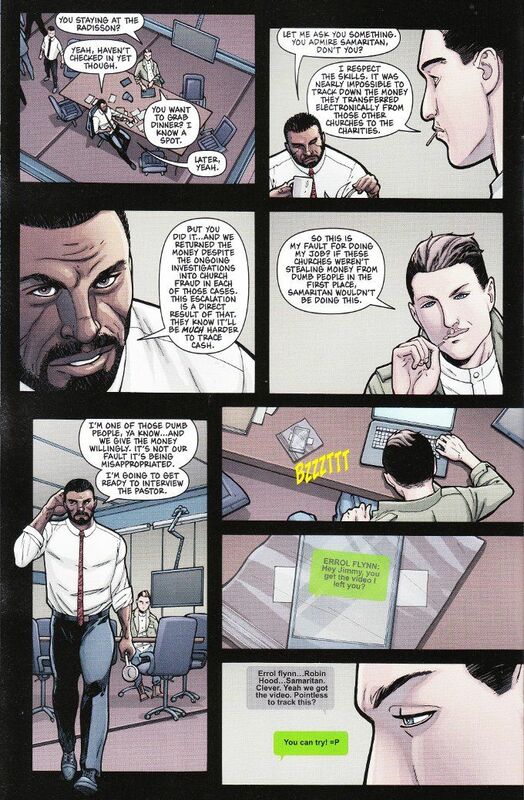 At the same time, Eddie makes a hard decision regarding his relationship with Iris which will leave Joe and Barry unsettled. The Flash: Rebirth by Geoff Johns. Even at this late stage in which we know what a villain he is, Tom Cavangh still manages to make "Harrison Wells" into a likable villain. And the episode's closing monologue is easily his best speech yet. The scene with Cisco in his lucid dream is shot in a very effective manner, with the fuzzy camera work and music emulating a dream incredibly well. The final effect is very trippy. The special effects for the sequence in which The Flash extinguishes a fire are top-notch. The sequence in which Barry chases after the bullets racing towards Wells and Cisco is exciting and well shot. Cisco notes that the photo of The Flash in the future shows Barry wearing a bright red costume with a white circle behind his lighting bolt insignia. This look corresponds with the original costume Barry Allen wore in the comics as The Flash. Cisco compares seeing the future newspaper to the movie Back To The Future and the photo of Marty McFly and his siblings that allowed him to monitor his timeline destabilizing. Caitlin notes that the byline for the story says Iris West-Allen. In the comics, Iris West and Barry Allen did get married, though she took Barry's name. Gideon is about to describe The Flash as the founder of something before Barry cuts her off. Perhaps she was about to say "The Justice League" - the superhero team which Barry was a founding member of in the comics? 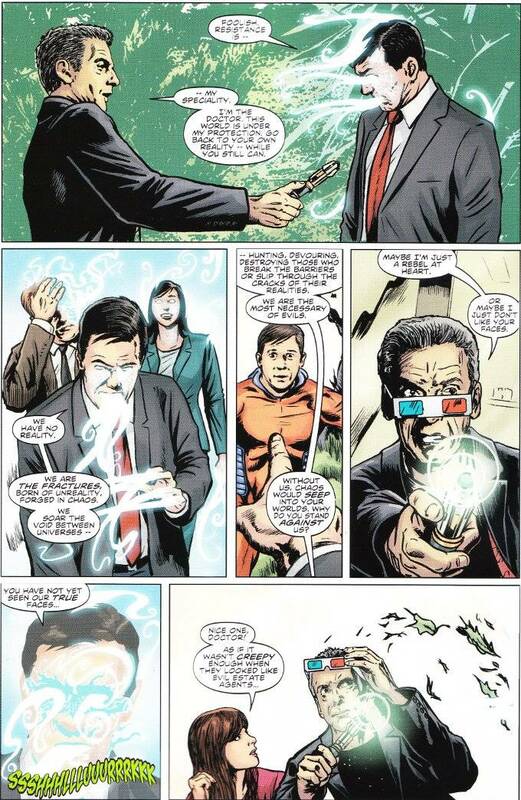 Cisco calls Gideon HAL - a reference to the malevolent AI from 2001: A Space Odyssey. When asking about the possibility of dying in reality if he dies in his lucid dream, Cisco makes reference to the movies Inception (where dying in a dream normally causes you to wake up) and Dreamscape (where death in a dream causes the death of the physical body). The glasses for the dream device that Cisco wears resemble the shades worn by the superhero Vibe as part of his costume in the comics. The glasses that Barry wears resemble those from the classic Captain Cold costume in the comics. Barry extinguishing a fire by generating a vacuum is a frequent feat that The Flash accomplishes in the comics. Cisco makes a reference to Indiana Jones and The Temple of Doom and how Dr. Wells killed him in his dream by attacking his heart. Cisco suggests they may be living in a causal nexus - a state where everything the affects a phenomenon becomes a factor in creating said phenomenon. In this case, by seeing Barry's future costume, this may cause them to change his costume to match the one in the future. Gideon describes herself as an interactive artificial consciousness. Cisco says that if he can get access to Gideon's operating system, he may be able to disable her memory core. The device Barry, Caitlin and Cisco build allow Cisco to see into his own dreams. Caitlin said she got the idea from an article on lucid dream therapy and the idea that it could be used to treat people suffering from Post-Traumatic Stress Disorder. The theory is that people will be able to objectively enter their own dreams and face their fears. She has difficulty in figuring out how the subject will be able to talk while this is occurring. Caitlin claims the amount of electricity needed to trigger lucid dreaming is probably harmless. Wells helps complete the communications interface for the device, noting that the middle brain lights up with activity during dreaming while the higher brain remains dormant. With both sections stimulated, it then becomes a matter of finding the right frequency to stimulate the language center, allowing the subject to speak while dreaming. Wells suggests starting with a frequency of 45 hz. The glasses attached to the dream device emit a low-level delta wave that should assist the subject in sleeping. As Wells begins his attack in the dream, Cisco's blood pressure jumps to 200 over 147. This is well above the threshold for a hypertensive crisis - i.e. heart attack or stroke. 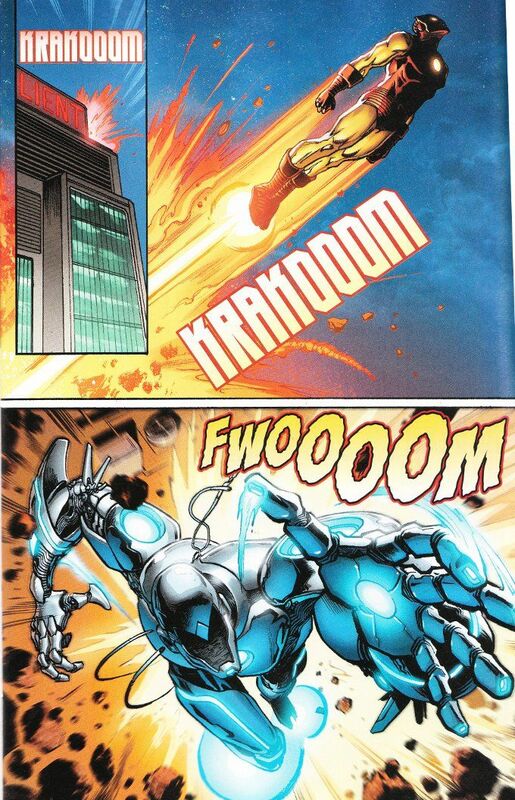 Barry is able to create a vacuum by rotating his arms at super-speed, generating a wind funnel that blows all of the oxygen out of the room. Cisco creates a speedster-proof force-field to protect him from Wells as they try to trick him into confessing to Nora Allen's murder. Eddie: Oh, thanks! I appreciate it so much. And so will the future Mrs. Thawne. (excited) Iris Thawne! Sounds pretty good, huh? Barry: (quietly as Eddie walks off) I have a feeling she's going to want to hyphenate. Barry: You know, I couldn't have done any of this without you. Wells: I feel the same way about you. Barry: You ruined my life! All of our lives! Caitlin: We stood by you after everything that happened! Wells: I can see how this might be difficult for you to understand, but trust me. Your lives now are so much better because of what I have done for you. Joe: You don't have to hide anymore. 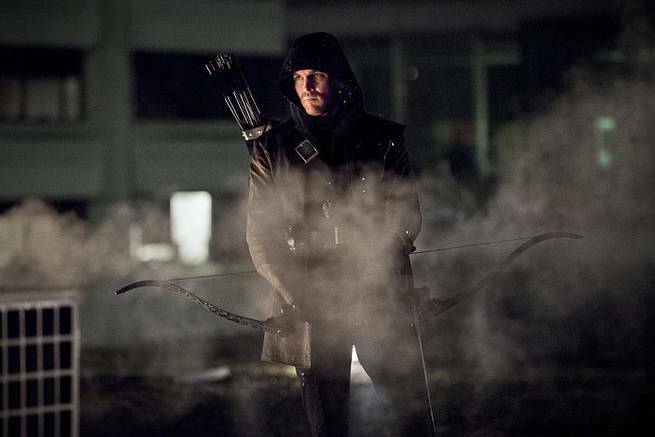 We know you're not Harrison Wells. Just tell us who you are. Wells: A confession will get you nowhere. You've seen who I am. You know what I can do. 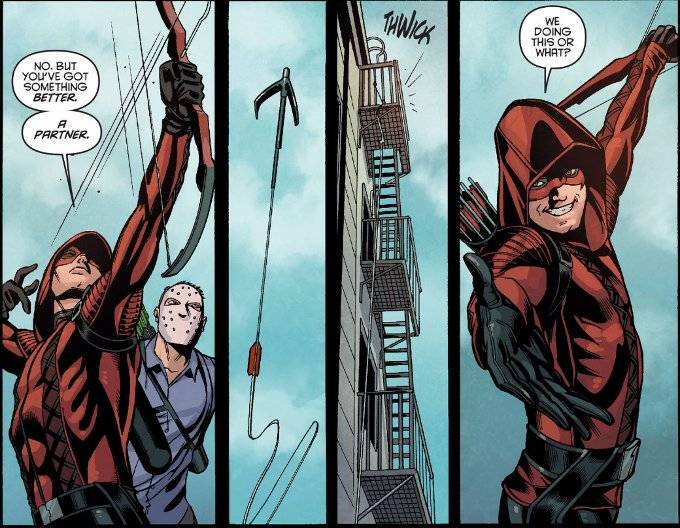 Barry: You want to kill me? Go ahead. I'm not going to fight you but.. just tell the police what you did. Get my dad out of prison! Wells: I don't want to kill you, Barry. I need you. And... (chuckles) I also did not anticipate, as difficult as the past 15 years have been for me, how much I would come to love working with you. With all of you. And yet, that does not change what needs to happen. Barry: Then face me now! 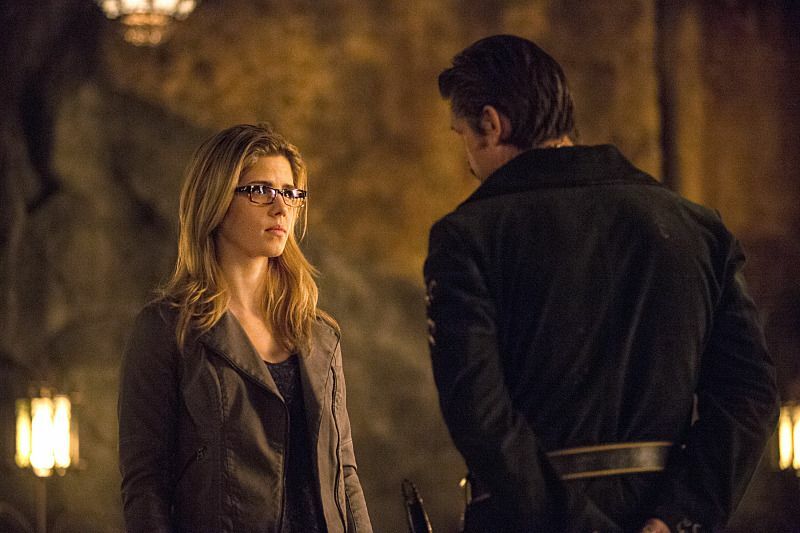 Wells: Oh, we will face each other again. I promise you. Soon. Very. Very soon. Eddie: You might as well take that mask off. I know it's you, Wells. Or whoever you really are. Reverse-Flash: Well... allow me to introduce myself. (removing his mask) My name is Eobard. Eobard Thawne. Eddie: I don't understand. Why do you have my name? Reverse-Flash: Why? Well, because we're family, Eddie. Eddie: Funny I haven't seen you at any reunions or weddings. Reverse-Flash: (laughs) That is funny. And the reason for that is because as far as those guest lists are concerned I haven't been born yet. Eddie: So that's why you didn't kill me that night at STAR Labs? This whole thing... it's been about me? Reverse-Flash: Not a chance. You, my friend, are simply my insurance. Wells: You look so young... And I could kill you. Right now. So easy. What I wouldn't have given... all those times before to have you like this. So... helpless. But fate... fate's tricky, isn't it? I come here to destroy you. And then to get home I have to be the one who creates you. (chuckles) I will say... it's been an education. Watching you grow up all these years. Science fairs and soccer games. No hint, no sign, no trace of the man you will be one day. For whom I have nothing but hate. And to be clear... nothing is forgiven. There will be a reckoning. I promise you, Barry Allen, that you will die. Barry refers to the events of 109 and how The Reverse Flash said they would be fighting for centuries. The April 25, 2024 newspaper discussing the Crisis in which Barry Allen disappears makes mention of Starling City's Green Arrow, The Atom and Hawkgirl being present for the fight with The Reverse Flash which preceded The Flash disappearing. 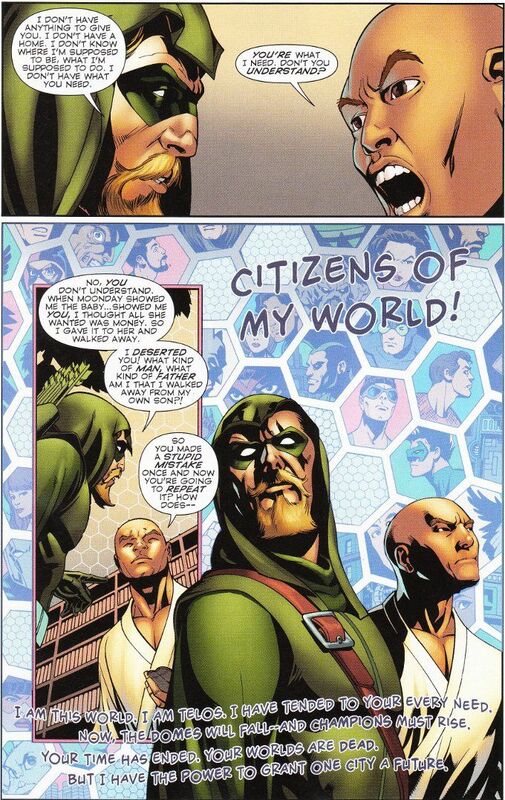 This reveals that, at some point, Oliver Queen will adopt the name of his comic book counterpart in the DCTVU. Hawkgirl has been confirmed as part of the cast of the so-far unnamed spin-off series that will also feature The Atom. The newspaper also confirms that Barry and Iris get married in the future, as the article is written by Iris West-Allen. Gideon confirms that Barry Allen becomes the director of the CCPD CSI Division in the future. Gideon only knows Harrison Wells as Harrison Wells and does not understand the question when asked who Wells really is. Gideon says she will happily obey any command Barry Allen gives her - including not telling Wells of their discovery of "The Time Vault" - because Barry Allen created her. Eddie asks Joe for permission to propose to Iris. Joe refuses, because he believes Iris truly loves Barry and she will have a miserable life if she marries the wrong man before realizing that. 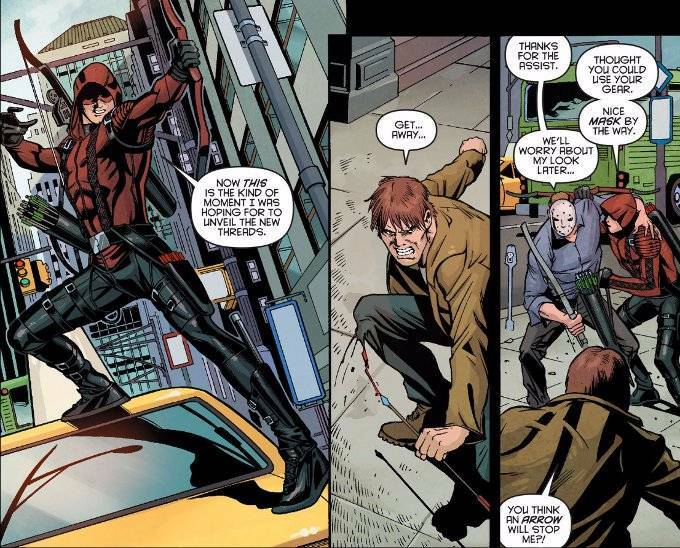 Cisco refers to how he and Joe discovered in 113 that Barry is destined to travel back to the night his mother died. 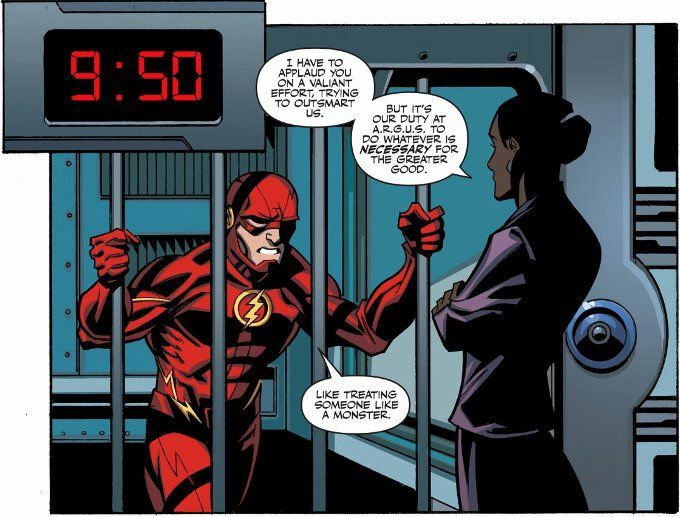 Barry refers to the events of 115 and how he time-traveled back one day as well. He theorizes that Cisco's visions of being killed by Dr. Wells are actually memories of the alternate timeline. 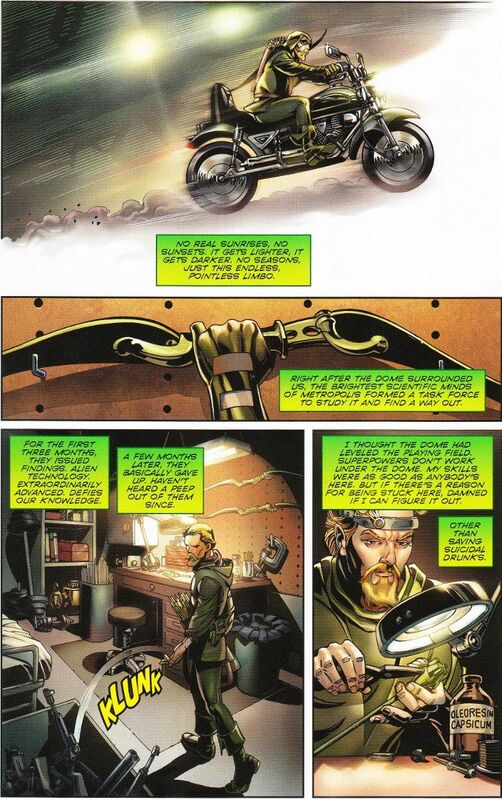 The information Cisco gleans from his lucid dream matches what he learned before his death in 115 - how the energy readings for the Reverse Flash trap don't make sense and how they instead generated a hologram of The Reverse Flash. He hears but does not seem to remember the Reverse Flash's real name - Eobard Thawne. We see Captain Singh's fiancee Rob for the first time since 115. He is among the people The Flash saves from the fire. Iris' research into the various odd things in Central City leads her to conclude the particle accelerator explosion at STAR Labs was responsible, that The Flash got his powers from there and that The Burning Man (i.e. Ronnie Raymond) worked there. Joe West kills Hannibal Bates (a.k.a. Everyman) whom Wells released and convinced to impersonate him in exchange for his freedom. Wells had surveillance cameras set up watching Cisco and Caitlin's apartments, The West home, Barry's lab and the newspaper Iris worked at among other locations that enabled him to spy on Barry, Joe, Iris, Caitlin and Cisco at all times from The Time Vault. As Barry, as The Flash, assures Iris that he will rescue Eddie, a blue spark passes between them. This seems to reawaken Iris's memories from the alternate timeline in 115 as she suddenly realizes that Barry is The Flash. 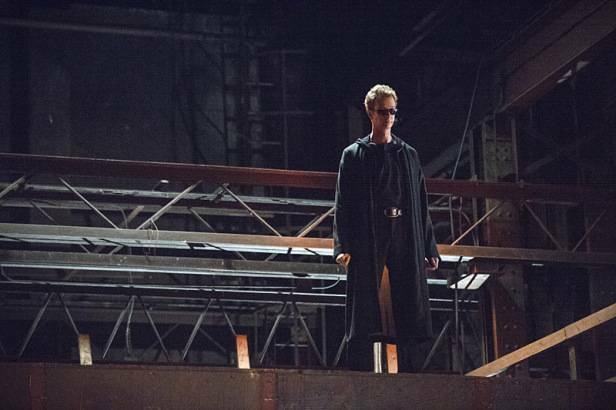 As the episode ends, Wells takes Eddie to his hideout in the sewer. He introduces himself to Eddie as Eobard Thawne. He is confirmed to be from the future and Eddie Thawne's future descendant though we still don't know from how far in the future he's traveled. 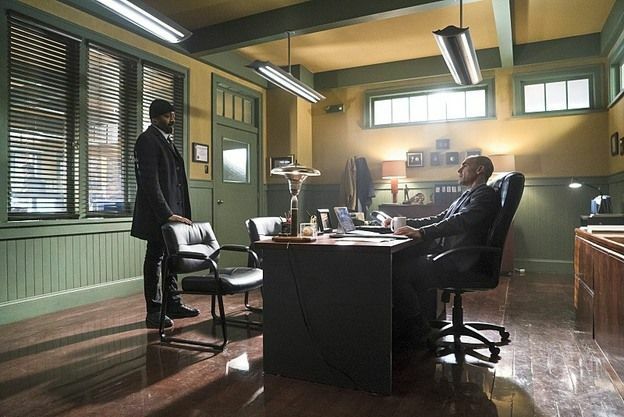 In the flashbacks, we see the first meeting between Wells and Joe West, where Wells convinces Joe to let him take Barry to STAR Labs despite Joe having a bad feeling about him. In the flashbacks, we see Iris talking with a comatose Barry shortly after Eddie Thawne asked her out for the first time. She credits Barry with saving her and her father's relationship in the wake of her mother's death and making them a family again. In the final scene of the episode, we see Eobard Thawne confessing several things to the comatose Barry - chiefly of how he came back in time to kill The Flash but how returning to his own time requires him to turn Barry Allen into The Flash. A powerful episode that is surprisingly free of the series usual light humor and witty dialogue. Still, the plot is pushed forward though we don't really know any more about Eobard Thawne and his precise motivations than we did last week. We do learn a fair bit about the future of the show, however, and Tom Cavangh turns in his finest villainous monologue yet in the show's final minute. In which we continue to explore Ankh-Morpork, Death has a Near-Rincewind experience and we continue our string of petty thefts and taking everything we can get our greasy little mitts on. In another time and another place, a scientist who had lost his wife and children in an accident developed a suit that would enable him to traverse the void between realities. He found another world - one where an accident had killed his alternate universe counterpart - and leaped into the space between. Now the scientist is in our world.... and he hasn't come alone. He's been followed by The Fractures. The Fractures are the repairmen of The Void. Auditors of reality who destroy all that might threaten the continuity between worlds. 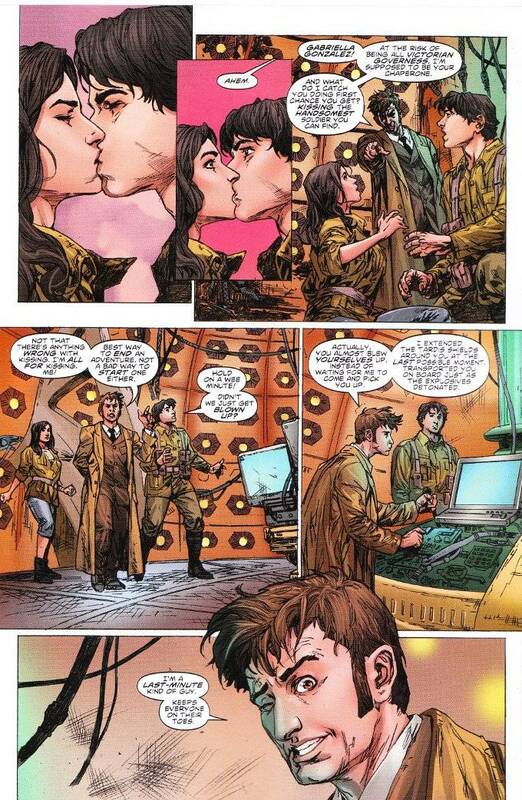 Only The Doctor might be able to save the day. 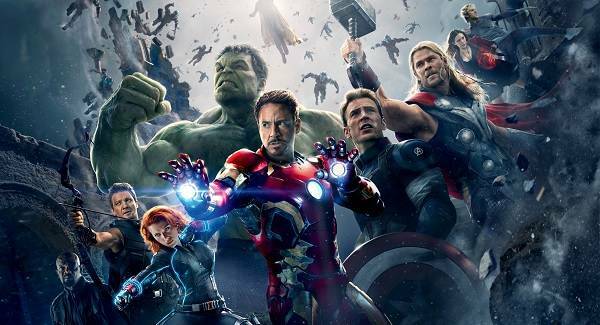 But while he might be able to fight The Fractures, can he do it without a family from being broken apart in the process? The artwork by Brian Williamson is excellent. 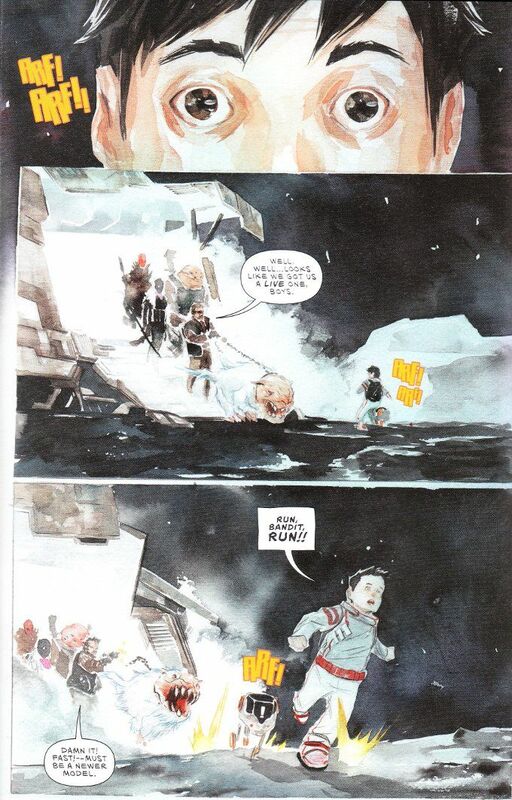 I commented in my review of the previous issue that the only flaw to Williamson's work was a few instances of over-inking a few panels here and there. There are no such flaws in this issue. In which we begin to explore Ankh Morpork, spend ten minutes in a room with a complete git, talk to some very old heroes and meet an amazon warrior who resembles but is legally distinct from Red Sonja. 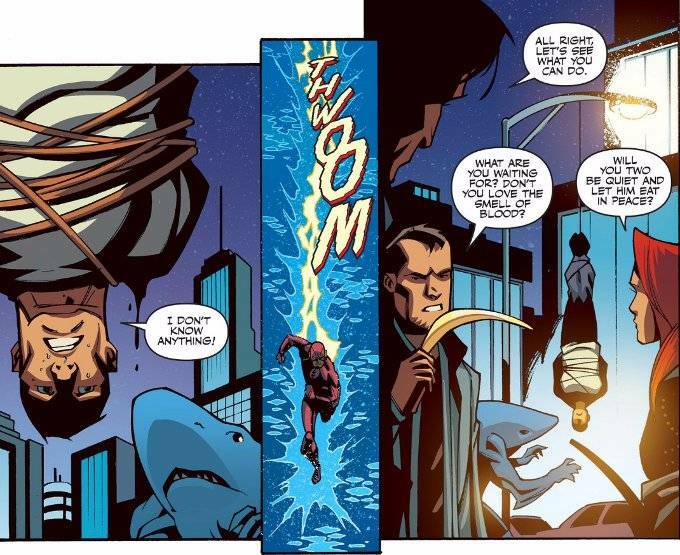 Trapped in the bowels of ARGUS, Barry Allen has only minutes to save the unfortunate King Shark from killing again at the behest of Amanda Waller. Naturally The Wall doesn't care about the toll the shark-man's endless hunger is taking on his mind - only that he's an asset that Task Force X can use. 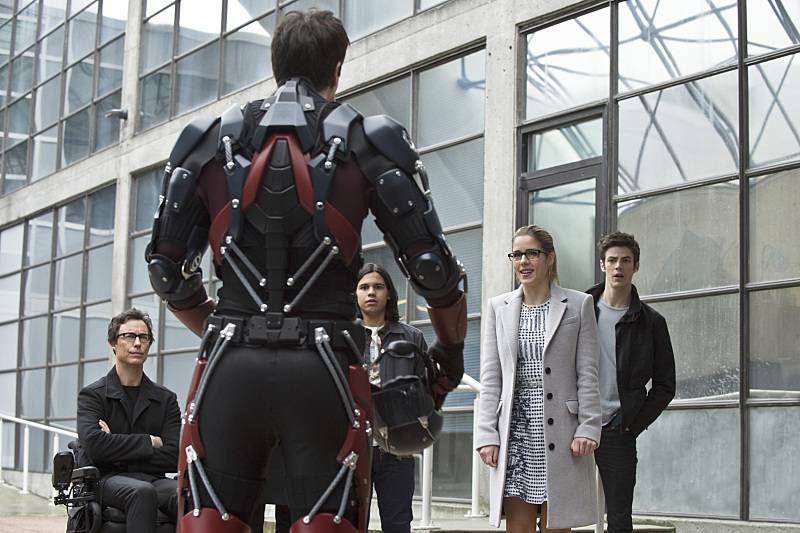 A little help from his friends may get Barry loose but can even he reach Coast City in time once he's free? This latest issue is thrilling right up until the very last page where a whopping big plot hole reveals itself as we find out King Shark's target was a terrorist who needed to be questioned about an active bomb. 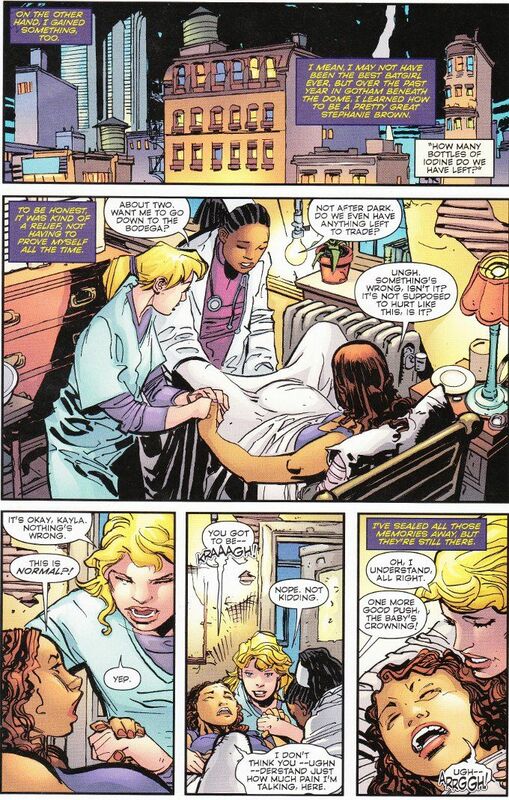 Of course Amanda Waller wouldn't lose sleep over a dead terrorist. But the idea that The Wall would send an untested resource - to wit, a man-eating shark-man - out to capture a target who needed to be taken alive and hope that it could be kept under control long enough for an interrogation to occur is just plain idiotic! Phil Hester is back in the artist's chair this time around and I can't say I've missed him too much. Some of the pages in this issue look rushed and sloppy. And I really do believe Eric Gapstur's style better fits the brighter aesthetic of The Flash universe. John Carter has arrived just in time to stop the execution of his true love, the princess Dejah Thoris. But will he be able to escape with his life and his love? Not if the conniving Captain Clark - an old enemy from John Carter's days as a Captain in the Confederate Army - has anything to say about it! With his creation of Captain Josuha Clark, writer Ron Marz has crafted a worthy arch-enemy for John Carter. 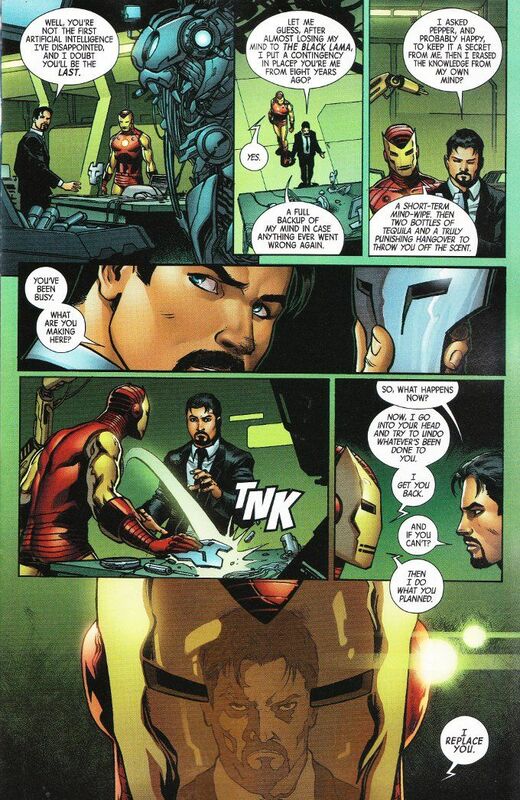 Clark is everything that Carter is not while seemingly having much in common with his fellow Captain. Chief among these differences are their motivations, with Carter being motivated to battle by love and a desire to protect those in need. Clark, on the other hand, is motivated by hatred and a need to win, being more barbaric than Carter despite his veneer of civilized courtesy. The artwork on this books continues to impress. 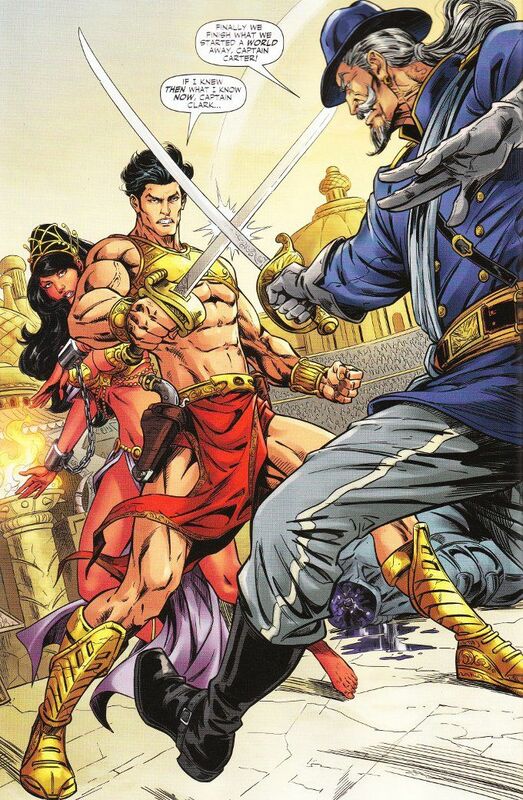 Abhishek Malsuni brings the world of Barsoom to life as few artists have. The inks by Zsolt H. Garisa perfectly enhance the original art. And Nanjan Jamberi provides one of the finest color art jobs I have ever seen. Trapped in the No Man's Land between the German and English forces of World War I, The Doctor and his current companion - Gabby Gonzales - have had a trying time of it. The Weeping Angels have made a banquet of the soldiers presumed lost to the bombings and battling. 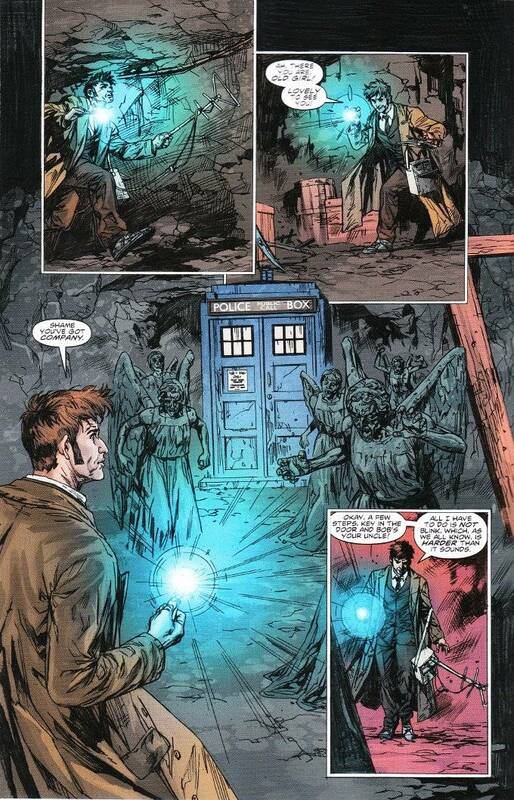 And now, in the maze of trenches and tunnels under the desecrated earth, The Angels have The TARDIS! 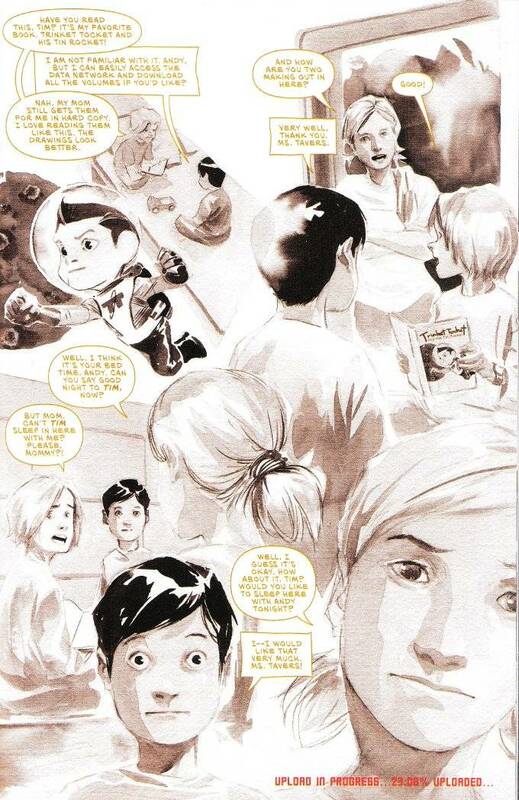 Robbie Morrison brings what has been a delightful story to a satisfying conclusion. 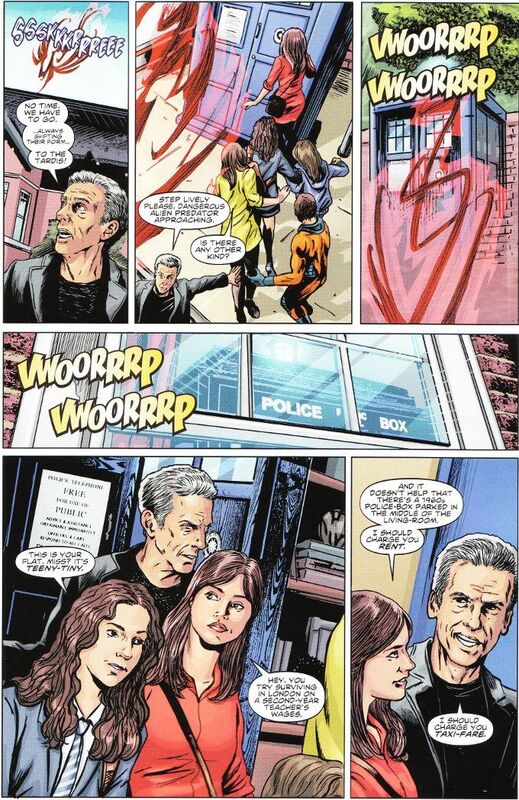 This issue, combined with the three parts preceding it, constitutes one of the most well-written Doctor Who stories I've seen in any medium. The epilogue at the end also proves to be a fitting tribute to every soldier who has ever given up their lives for the lives of others. The artwork proves the equal of the story. Arianna Florean and Elena Casagrande make use of a cartoonish style in depicting the artistic Gabby's personal journal entries. Different, but no less effective, is the more realistic style used by Daniel Indro, though his inks are overly heavy at times and threaten to obscure the original pencils. In which I explore Unseen Univeristy, pester the cook, harass the faculty and aggravate the Librarian. A year has passed since the dome came down over Gotham City and Stephanie Brown has found a new peace. 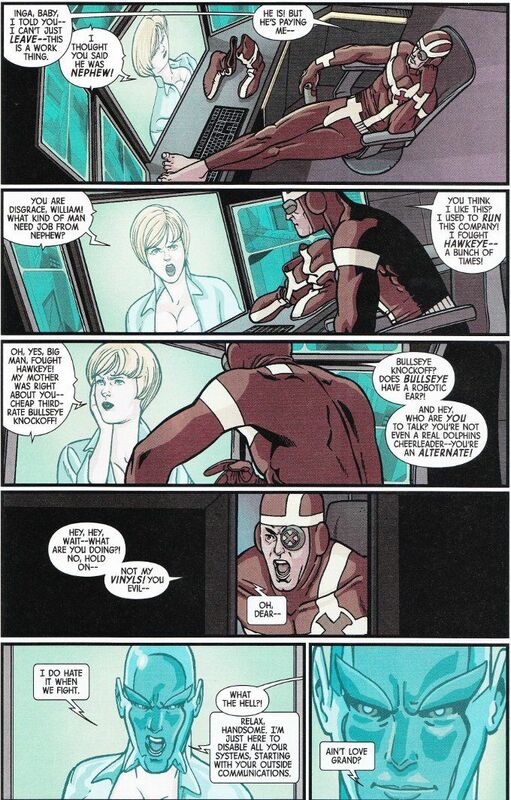 She's abandoned her super suit for surgical scrubs and gone to work as a nurse's aide. 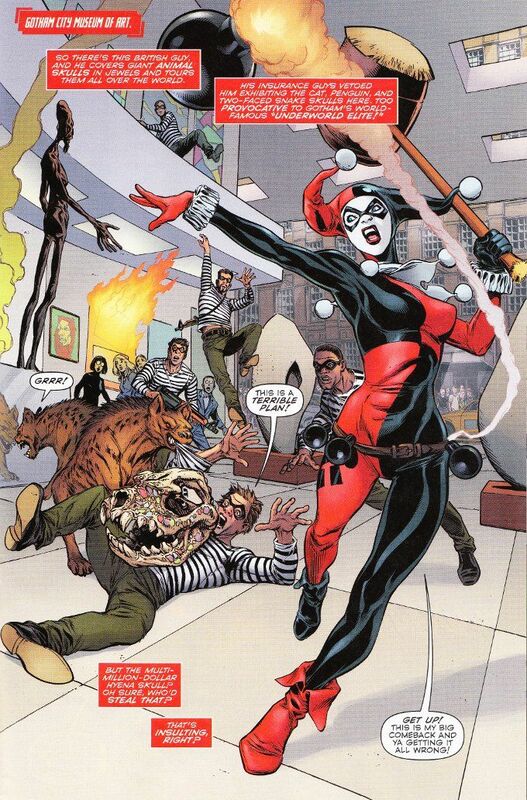 After all, with Black Bat and Red Robin around it's not like the city needs Batgirl. Except the city DOES need Batgirl. For when the dome lifted and The Powers That Be insist on a fight to the death to decide which of two cities lives or dies, it was Stephanie Brown who was chosen to stand for Gotham City. And with Steph out of action for so long, it's doubtful she'll have a chance against the Catman of another world who is her chosen opponent. I'm somewhat conflicted about the story of this issue. After everything Stephanie has done to prove herself as a hero - as Spoiler, as Robin and as Batgirl - it seems a bit odd that she'd give that up as readily as she seems to in this issue, even if she did find another way to help people. Ignore the base concept, however, and the dialogue in this issue is spot on, with the friendship between Cassandra Cain and Stephanie Brown being perfectly captured. The artwork is similarly unpolished. 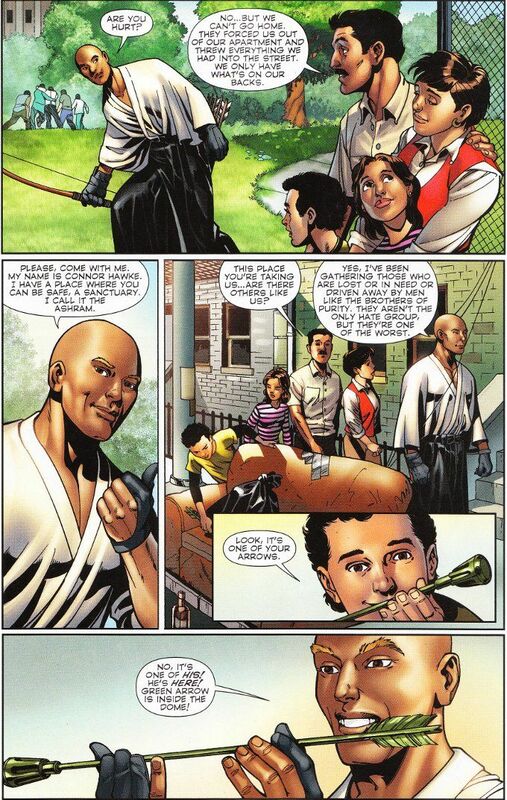 The pencils are average, at best, with the characters looking misshapen and half-finished in some panels. And the inking and coloring are some of the sloppiest I've ever seen on a professional book. Sorry Steph and Cass. I'd hoped to see you return. But not like this. Trapped in a prison he never made, Howard The Duck seems doomed to be a part of The Collector's collection! Luckily, Howard is locked up with Rocket Raccoon and the rest of The Guardians of the Galaxy are ready to spring their pal while The Collector is away on important business (i.e. attending a Con). Unluckily for Howard, they may get him killed long before he ever sees Earth again, much less gets paid for his current case! 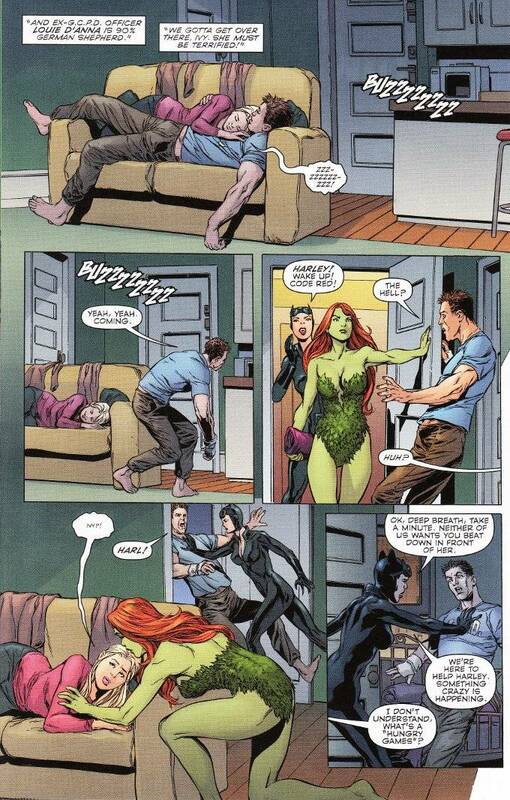 Not surprisingly, Chip Zdarksy's script for this issue proves as hilarious as the first. Curiously, less of that humor is born of Howard himself and more from the sheer insanity of the Guardians of the Galaxy, such as Rocket's shaving a totally unnecessary treasure map into his fur. 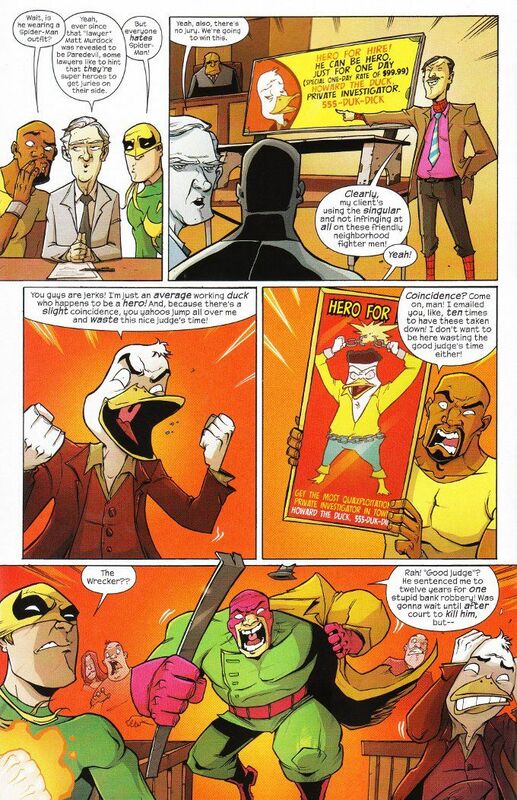 There's an equally funny back-up story where Howard is sued by Iron Fist and Power Man over the right to use the phrase "hero for hire" in his advertising. The art team deserves just as much praise for their contributions to the book. 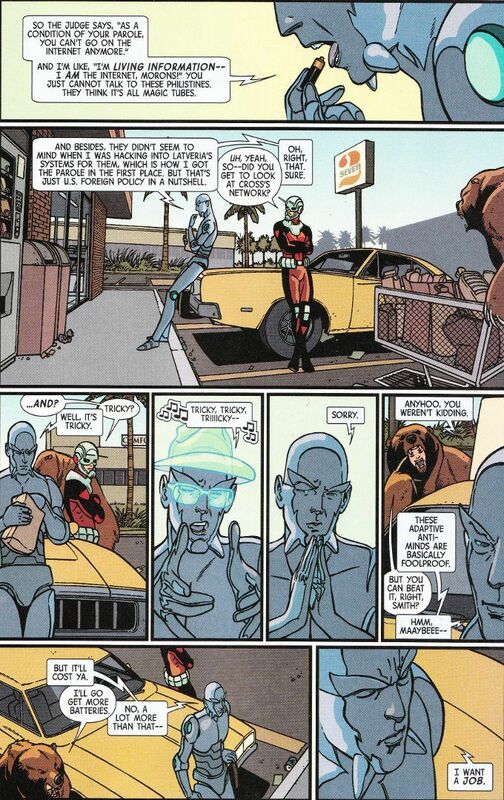 Rob Guillory's amazing facial expressions add to the fun of the back-up story. 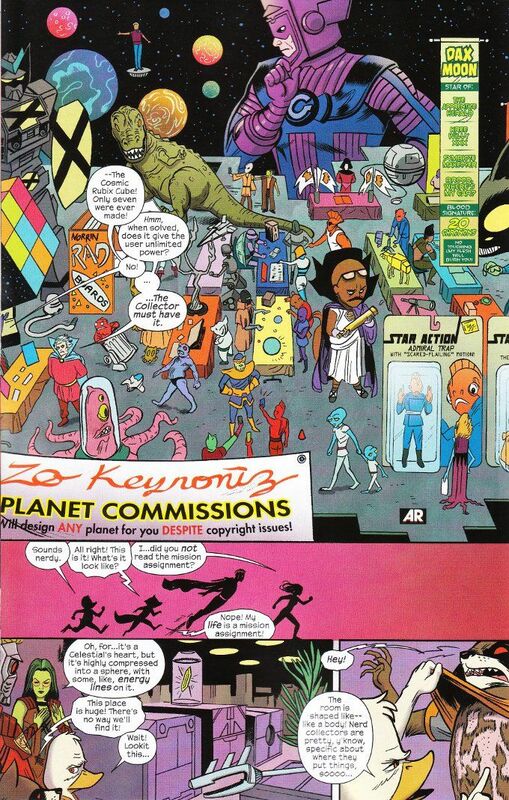 And Joe Quinones is to be commended for how many little sight gags he fits into every panel of the main feature.